Sol sent me a link yesterday about Germany recommendation to stockpile food and to be honest I hadn't been at my computer much so I would have missed it otherwise. There are some news articles from the BBC here and the Independent here. 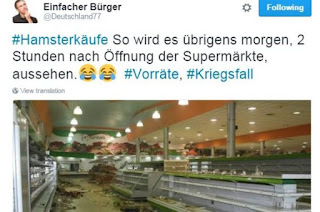 In short the German Government has advised it's citizens to stockpile food and water for the first time since the Cold War. This has resulted in what the Germans call "Hamsterkaeufe" or panic buying. 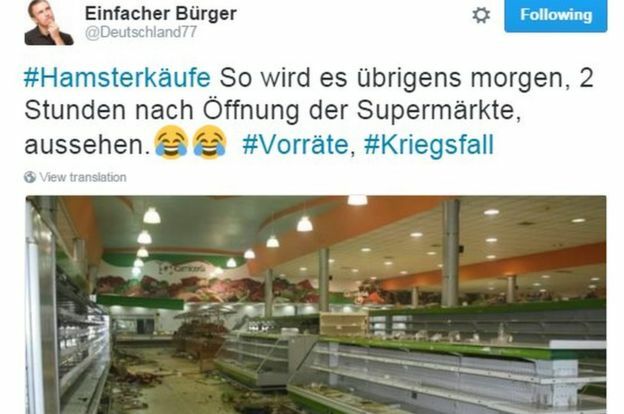 Shelves in some supermarkets have been stripped bare in a few hours with Germans trying to get enough food for the recommended 10 days and water for the recommended 5 days in case of terror attacks. Another wake up call to keep household essentials in stock, if you lived week to week with your food then a simple news item like this could leave you without food for that week without anything even happening. Do you have what the German Government is recommending in your store? What would be the thing you'd have to rush out and buy? I've got more than ten days food in store (considerably more!) as most winters there are times when I can't get out for up to two weeks. However, I have never stored much water. As yet I don't feel the need - a couple of jugs in tne fridge is my usual limit! Winters are the one thing that we prepare for here as well. The village shop is only a couple of miles away but it's far nicer not to have to make that trip in heavy snow! I haven't seen a list of what the German government are suggesting, but I do have some stores, mostly because like FC, it can be hard getting out of my village in the winter (though not for as long as two weeks). I also store water, mostly because we have leaks in the water mains with tedious regularity. I don't buy bottled water though- I use 5 gallon camping containers and add tiny amounts of bleach, as recommended by the US Federal Emergency Management Agency- you can't taste it and you can leave it to evaporate before using. (Actually, I put in less than they suggest- I don't want to drink that much bleach.) You can do the same thing in used water or fizzy drink bottles, just rotate their use as the thinner plastic degrades faster. which says, slightly less sensationally "Also, it is always useful to have: Bottled water, ready-to-eat food (e.g. tinned food) and a bottle/tin opener, in case you have to remain in your home for several days." The unrest in some UK cities a few years ago also showed how precarious our 'just in time' supermarket stocking system could be. It's reckoned that 3 days without food is how long it will take for people to rise up against the authorities- '9 meals from anarchy' was the phrase coined. I'm not in any way a 'prepper', it just seems to be sensible to me. It's all food we eat anyway- I don't have boxes of emergency dehydrated meals- we just have more of it. I'd really recommend 'Independence Days' by Sharon Astyk (and pretty much anything else she's written- I haven't read all her books but I've enjoyed the ones I have). It's not about stockpiling food and weapons, but about gaining independence from our industrial food system- it's subtitled 'A guide to sustainable food storage and preservation'. Keeping enough food stored that life doesn't fall apart when the supermarket shelves aren't stocked for whatever reason is part of that. Also a great link, I can't even remember seeing that leaflet from the UK government. I don;t store water and I think its something I need to address, that or at least a way to treat enough for us to drink. As for just in time supermarkets it's always something I've thought about and I like to think we have a bit of food for a little while at least! Chocolate and sweets would be high on my list as well! We're always well stocked up. I hate shopping and I restrict my supermarket visits to once a month. We've got 3 chest freezers full of pork, chicken, lamb... one portion meals from leftovers. We could easily live for a year with what we have in the house. Water would indeed be one thing that we would need to stock up on as our tap water is rank. It's riddled with chemicals one of them being fluoride the other chlorine which becomes cancerous if used with acidic peaty water. If push comes to shove we should test the water in our stream to see if it is potable. I hate shopping and we tend to do ours on line each week. We only have one chest freezer and one tall one, but both are full, one has about 3/4 of a cow in it! There are a few simple solutions to the water (in this country at least I think), but things I need to still get sorted. I might do a post on this next week. I always have a lot of food in the house--especially the basics like flour, yeast, oats, and sugar. I don't have much for canned goods.....I suppose I should remedy that. I do have full freezers and we always keep plenty of fuel on hand to power the generator in case we lose power. We have a lovely trout stream just down the road that we could use in a pinch, plus all my rainwater tanks. I do have a water purifier on my "wishlist". I NEED to get that one ordered! I am hoping for a Berkeley filter for christmas. i could NEVER RECOMMEND BERKEY FILTERS ENOUGH!!!! in fact, they should be paying me for the free advertising i have done from them over the years. we have an ad-free blog so have a look and see how much we love our berkey filters. we have been using them for over 10 years...we save only a few dollars a month specifically for filters and then add to our stash of filters every year/year and a half. they are a godsend and you don't need to buy the towers...just the berkey filters. then you can make a contraption with 2 5gal food grade buckets and make your own filtering system. we filter our rainwater through our home-made system for 8 years now....it's an investment! as is a rainwater catchement system or rainbarrels. ding me at kymberzmail@gmail.com if either of you has any questions. I'll look into these filters as well, they wouldn't be a bad thing to have in store! Sue - Have you considered a can rotatory door! Like I made a couple of years ago! The substance of the recommendation seems a bit redundant. I mean, it just plain makes sense that everybody save some for a rainy day in times of plenty. But it seems folks don't think that way any more. They are more concerned with how to be more PC than the next person or the fanfare in Rio. I guess I'd be more interested in knowing why the German government suddenly sees it necessary to make this recommendation. What suddenly changed in their view? and what is the imminent danger that motivated this edict? i agree with M. Silvius on all points...including questions. It's because of the recent terror attacks that Germany has had and the treat of more. I think There's a few of us that need to address the water issue! I've recently been trying to reduce my emergency stocks. Checking eat-by dates, and getting rid of things that we just never eat. Maybe I'll re-stock. Rotating it is essential, and it needs to be things that are in your normal diet as well for that reason. I have a wartime mentality. My larder is heaving and I have three freezers (we do have two allotments and freeze a lot of what we grow for winter use. Water would be the only item on my list. We did have a well in what is now our utility room, which my ex husband filled in. I suppose we could start digging! A wartime mentality is no bad thing! I haven't done very well on preserving things for winter use this year - Too many projects on the go is my only excuse, but plenty of meat walking around! They always say storing on the hoof is the most resilient way to preserve your food, it certainly won't spoil in a power cut and has a very long expiry date! I bought half my water yesterday. 17p for 2 litres in lidl. There were others there doing the same. A lady behind me had her kids with trolleys as well. She tapped her nose and only said to me "Germany". I turned forwards again. But I did smile as I turned. there is a 2 year life on it. We take water in the car with us, as I drink quite a lot. I will work this into my normal rotations. Chappati flour was also on offer. A huge bag for £3 something. I will look into that as I need to add more diversity into our stores. I always find it amusing, that water is the same water that the dinosaurs were drinking but us humans have decided that if you put it in a bottle it will become undrinkable in 2 years!